Default Receive Connector – used to receive SMTP messages on port 25 from other Exchange Hub Transport Servers or the Edge Transport Server. I always recommend not to change the default receive connectors with the exception of setting Anonymous Users on the Permission Groups to allow other SMTP hosts to submit messages as well. This command will create a new Receive Connector, bind it to the IP address 10.19.67.33 (this should be on the network card of the server of course) and allow the IP address 10.19.67.201 to submit SMTP messages anonymously. However, only messages for recipients whose SMTP domain is an an Accepted Domain in the Exchange organization are accepted at this point. 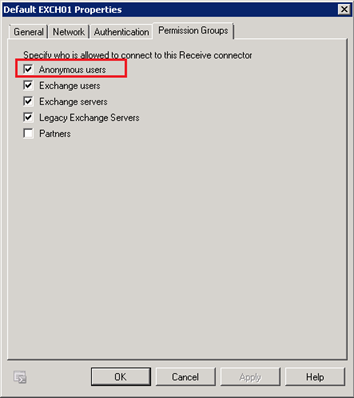 This is a default setting so the permissions on the Receive Connector have to be changed. Active Directory operation failed on DC02.labs.local. This error is not retriable. Additional information: The parameter is incorrect. The requested attribute does not exist. Microsoft is aware of this issue and it is currently being investigated. It looks like the schema upgrade during SP3 is not performed properly sometimes, resulting in an incorrect schema for Service Pack 3. Unfortunately the setup application of SP3 continues, resulting in these kind of errors. After this creation of a new Receive Connector is successful. When this issue is fully investigated by Microsoft and a solution is available an official Microsoft knowledgebase article will be available as well.